The World Health Organization Executive Board Meeting takes place every January at WHO Headquarters in Geneva, Switzerland. The representatives of 34 member states make up the Executive Board and discuss the work of WHO, both technically and managerially. Also present at the meeting are other member states, representatives of UN agencies and non-state actors, like IFMSA! 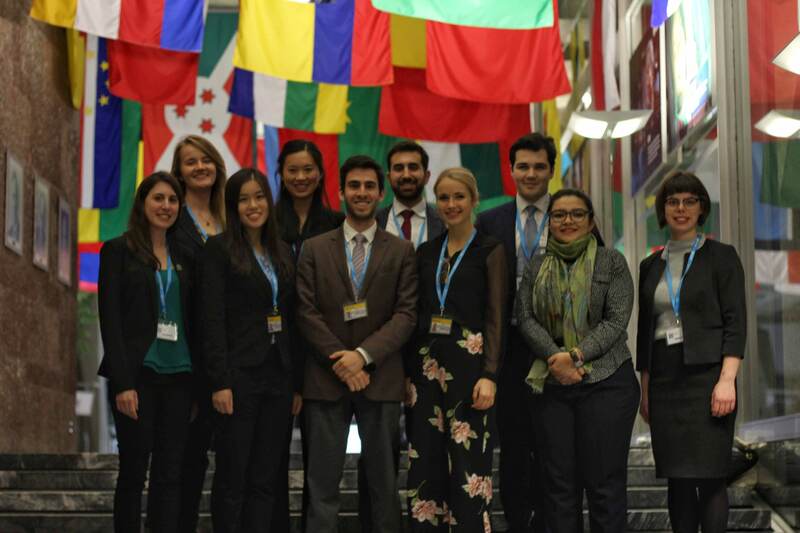 Our delegation includes 11 members representing AMSA (Australia), CFMS (Canada), LeMISC (Lebanon), MSAI (India), ANEM (Portugal) and SfGH-UK (United Kingdom) as well as representatives from IADS (International Association of Dental Students) and the IVSA (International Veterinary Students’ Association). The delegation was prepared for the meeting by the Liaison Officer to the World Health Organization, Charlotte O’leary, through several online meetings and discussions about different agenda items! The delegation was divided into small groups working on different areas of Agenda Items. These range from communicable diseases to access to medicines, refugees’ and migrants’ health to non-communicable diseases. The delegation worked on draft statements to be made to the executive board meeting that you’ll hear more about in our follow up blog post! The discussion then turned to the WHO’s programme budget, which was more exciting than it sounds, as Member States were concerned that while overall funding was high, its application across different programmes appeared disproportionate. Several countries mentioned the underfunding of NCDs relative to their disease burden. Another important point mentioned by Member States was that increased funding was needed for WHO Country Offices, to allow for more technical input to national governments. IFMSA could not give any official input to any of the agenda points today, however, we met with many country and NSA delegates and took minutes of all the key points from today. We also had an opportunity to attend a meeting with the Knowledge Network for Innovation and Access to Medicines at the Graduate Institute of Geneva. At the meeting, we discussed priority information and evidence gaps related to innovation and access to medicines issues on the WHO agenda. In particular, we shared ideas regarding research development reform, market structure, intellectual property policies, and transparency. Issues regarding production and policy surrounding newer technologies such as medical devices, diagnostics, and artificial intelligence were also raised. Tomorrow, we will begin delivering our pre-prepared statements. The first statement on behalf of IFMSA will be on the Implementation of the 2030 Agenda for Sustainable Development, read by Vivian Tan from Canada. Warm Geneva greetings from the delegation!